Most people grow up and have a room to themselves, or if not a room then at least a closet of their own. This being said, we tend to forget how nice it is to have this space to ourselves until we find a spouse and then have to make the move to a shared closet. While for men this might not seem like such a big deal, it's bigger than you think. Firstly, it's a big deal to women because they typically have more clothes, but that also makes it a big deal to men because they're going to have to sacrifice their space for her clothing. The first step should always be to de-clutter your existing clothing collection. Oftentimes you'll find that there are various items which are not able to be repaired and there's no reason to continue holding onto them. On another note, there are often items which you don't ever wear or use, so you might as well bring those in for a donation and let someone else make use of them. They're good for keeping smaller items that don't matter if they get wrinkled, this keeps them confined and out of the way. This is good if you have one long shelf. 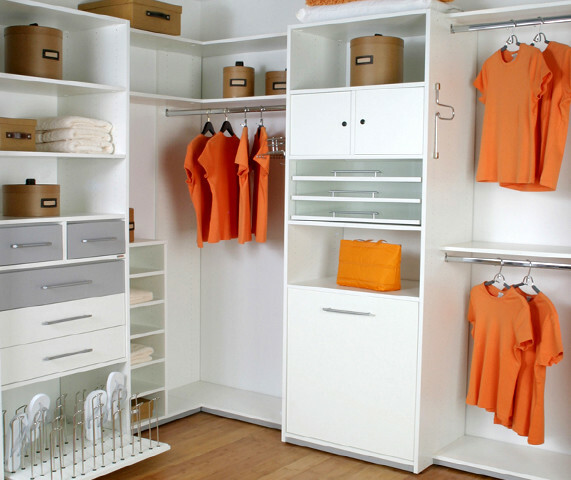 These will help to compartmentalize what you have and keep the piles separated neatly. This obviously would be used for shoes or other accessories in order to take up less space sprawled out on the floor and instead hanging up somewhere neatly. This would be the alternate option to the shoe rack, but this one is limited by the space available to you, so it won't work in all situations. 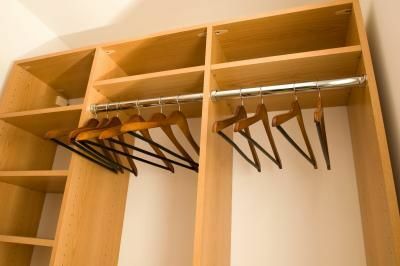 If you're stuck in a small or very limited area, it might be a good idea to only keep the clothes that are in season out and easily accessible and put the other clothes away until their season comes around. Remember, you're sharing the closet with someone else now, so you can't just be lazy and hang up something quickly on the wrong side of the closet. Not only will this probably annoy them, but it'll also begin to mix up clothes and then before you know it, it'll be difficult to find anything you're looking for. Keep in mind that if you're moving into a closet that's already being used by your spouse, you need to clarify ahead of time how much space is who's. If you don't set time aside to make this clear, you're going to start running into problems very quickly. Always be aware of what you're putting back in your closet. Try to make some time to physically go through the closet on a regular basis to determine if you can get rid of anything else in there. This will help save space and keep things as organized as possible. Be sure to shop around when you're looking for storage options. Not only will you find various options and features, but you'll also find a difference in price which could save you some money if you look hard enough. Don't be afraid to be creative! Just because something is meant to be used to store one specific thing, doesn't mean that you can't use it for something else if it works for you. Just because there's thousands of storage options available, doesn't mean that you have to have the best or the greatest. Just get what you need and what works for you. Don't be negative! If you mentally influence yourself that you're not an organized person, you'll always be unorganized. On the other hand, if you constantly reassure yourself that you are an organized individual, then chances are you'll start to become more organized. Lastly, be sure to invest in the proper hangars. Firstly, they're not expensive and secondly, they have specific hangars made for various types of clothes. Purchasing the correct ones could ultimately help you become more organized.